(BBC) US national security chiefs have lined up to warn American democracy is in the “crosshairs” of foreign adversaries for elections in 2018 and 2020. The Kremlin denies US claims it meddled in its last presidential election. Mr Coats said Russia was not the only country that was trying to intervene in US elections, without elaborating. One reporter questioned whether US President Donald Trump had adequately challenged Russian President Vladimir Putin on the matter at their bilateral summit in Finland last month. Mr Bolton stepped forward to maintain that it had been discussed. “President Putin said the first issue that President Trump raised was election meddling,” the national security adviser told reporters. Ms Nielsen said: “Our democracy itself is in the crosshairs. President Donald Trump was strongly criticised last month for not condemning alleged Russian actions, while he was in Helsinki. He has continually called investigations into the matter – and whether his campaign team colluded with Moscow in 2016 – as a witch-hunt. But the message from the White House on Thursday could not have been clearer. The FBI director said: “Russia attempted to interfere with the last election and continues to engage in malign influence operations to this day. 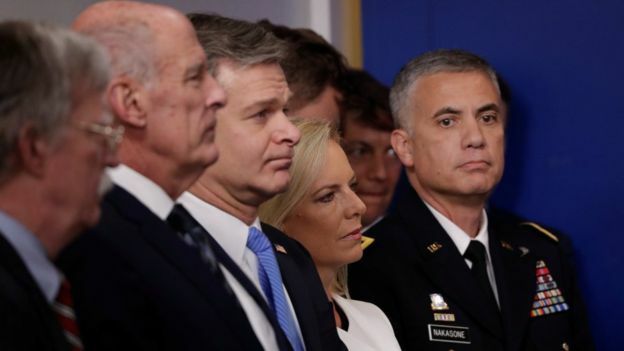 The NSA director said his agency and US Cyber Command were “prepared to conduct operations against those actors attempting to undermine our nation’s midterm elections”.